This hot water cornbread is shaped into cakes and fried in hot fat in a skillet.I will make this bread when everyone is ready to eat and don't have time to wait.Make sure you fry it golden brown on both sides.always use the best corn meal it make them taste real good.sometime we just eat them just by them self. In a heavy iron skillet add oil. Place cornmeal and salt in a bowl. Pour boiling water over meal and salt. Add melted shortening; stir well. When mixture is cool enough to handle, divide into four portions. Shape each into a cornbread cake about 3/4 inch thick. 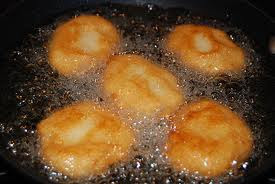 Place corn cakes in skillet fry until golden brown. Hot water cornbread recipe makes 4 cakes, serves 4.